Creag MacRanaich can be seen towering over Glen Kendrum when approaching Lochearnhead from Callander on the A84. It can be tackled from several directions, a relatively easy exercise if not being combined with Meall an t-Seallaidh. 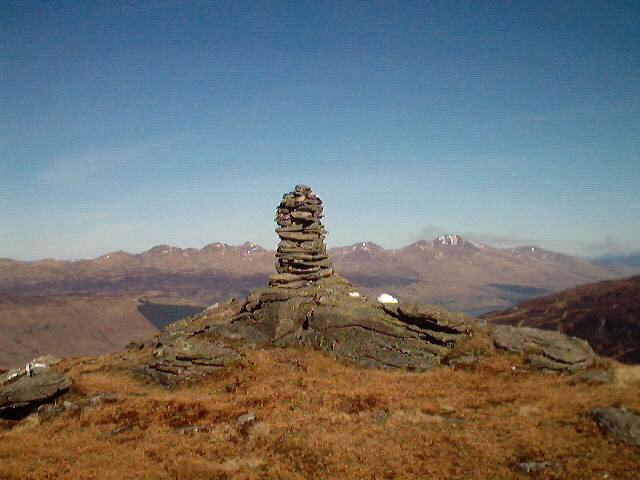 One ascent route is from the cottages at the head of Glen Ogle, but if tackling this in less than ideal weather, there is a tall cairn not far from a smaller one on the true summit that catches out the inattentive. It is also possible to approach this hill from Glen Kendrum on the southeast side or from the north on the track up Glen Dubh ' the one described here. Creag MacRanaich and Meall an t-Seallaidh can easily be achieved in one day following this route starting from Ledcharrie, going up Glen Dubh then returning via Lochan an Eirannaich and part of the Kirkton Glen right of way between Balquhidder and Glen Dochart to the start. Glen Dochart stretches from the junction of Strath Fillan and Glen Falloch at Crianlarich eastwards to Killin, following the course of the River Dochart as it flows through Loch Dochart and Loch Iubhair. It is worth noting that the Glen Dubh track from the north, that is shown to stop at Grid Ref. NN536266 on the Ordnance Survey Landranger Series 1:50,000 and the new Explorer' 1:25,000 sheet - revised in 2001, is in fact a well-used through-route that crosses the bealach between Creag MacRanaich and Meall an t-Seallaidh then descends Glen Kendrum to Lochearnhead ' a popular tourist and water sports centre at the west end of Loch Earn. There is parking on the roadside verge to the east of Ledcharrie Farm for about half a dozen cars (Grid Ref. NN506283) some half a mile east of an officially designated car park. The initial 750 metres or so from Ledcharrie starts through the farm and follows the route of the right of way through Kirkton Glen to Balquhidder on an almost non-existent path to where it continues on under a viaduct. Cross the stile over the fence and clamber up the bank onto the old railway track bed. Turn east and continue on an easy gradient along to a gate at the edge of the forest (Grid Ref. NN527284). Resist the temptation to take the new bulldozed track on the west bank of the burn before the gate, but rather go through into the forest for a short distance then turn first right up the old Glen Dubh track. This is a pleasant, wide grassy route at the edge of the trees with a couple of picnic tables - ideally sited alongside the tumbling Ardchyle Burn - to have a break at! A little higher up there is a junction. 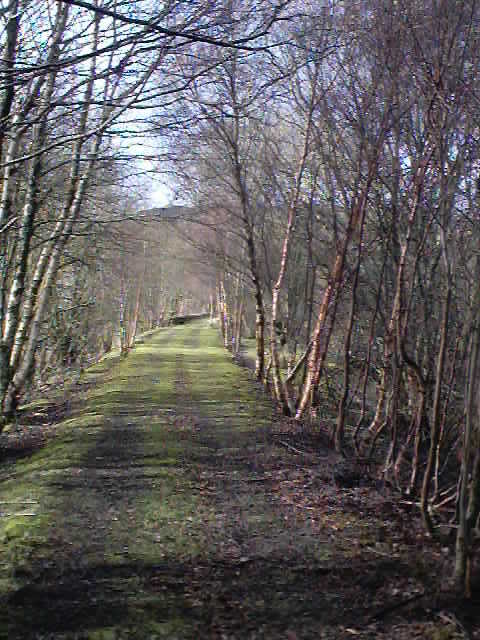 Keep to the right and after about 100 yards (90 metres) or so leave the trees on a wide track. Following the new track on the west bank means having to negotiate a wide, sometimes deep and fast-flowing ford above a gorge at the head of a fine waterfall. At Grid Ref. NN536266 just before where there has been an attempt to bridge a ford in the burn using a wide bore pipe covered with rubble; look for a faint, narrow path leading over a low mound to the left of the main track. Its start may be marked with a small pile of rocks! On the ridge above this path is a prominent V-shaped 'nick' formed by a gully that should be aimed for, following the route of the stream all the way up. The first, taller, summit cairn of Creag Mac Ranaich is just beyond this landmark and the true summit ' not nearly so impressive - another 100 yards (90 metres) farther on. 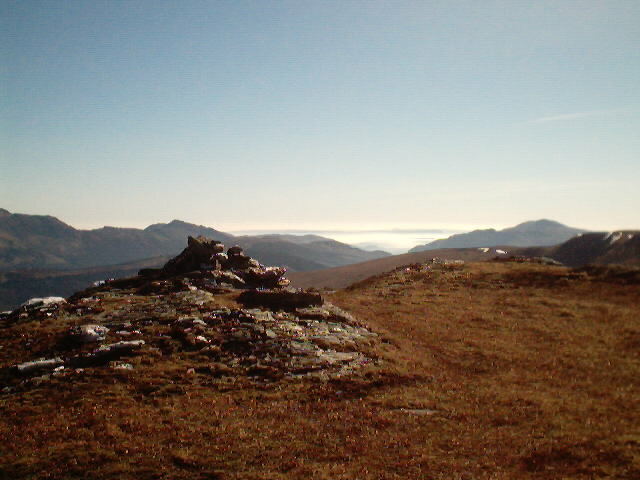 From the first cairn the top of the descent can be found to the west (right). The descent over tussocky grass and some small boulders to the main path below is very steep but manageable with care. From a point on the path, to the south-east of the bealach, at Grid Ref. 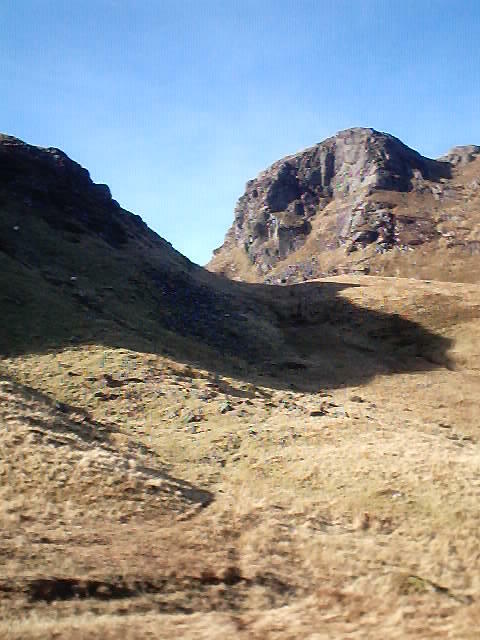 NN541248, set off across the heather to the foot of Carn Chreag where a steep, but relatively straightforward route heads south (left) towards the summit if Meall an t-Seallaidh. Take care along the top of the crags leading to the summit where a heavy cornice can hang when there is a lot of snow about. Back-track a short distance from here then follow the line of rusty fence posts to begin an arc north westward (left) to a jumble of large boulders that lie at the foot of Leum an Eireannaich The largest of the boulders is known as 'Rob Roy's Putting Stone'. The smooth, grassy path that rises from the forested area to the south, leads over to Lochan an Eireannaich, passes it to the north end then descends gently towards Glen Dochart. Keep to the less obvious left-hand track alongside the Allt a' Bhealaich and, lower down, look out for a line of wooden posts, spaced some distance apart, that have been positioned to direct walkers along the route of this ancient ROW. Pass under the old railway viaduct and back, through the farm, to the start. Start/Parking Roadside parking to the east of Ledcharrie Farm on the A85 between Lix Toll and Crianlarich (Grid Ref. NN506283). Grading This is an exposed and strenuous day walk over two Corbetts, suitable for fit and well-equipped hill-walkers only, through some fairly remote countryside. There are some good tracks and paths but much of the route is trackless and requires some accurate navigation, especially in adverse weather conditions. Sheep graze much of the area therefore dogs will need to be on a lead.